At a press conference held at the 3GSM World Congress in Barcelona, Nokia today announced three new E series business phones with the latest version of Nokia's Communicator device, the E90, grabbing the headlines. 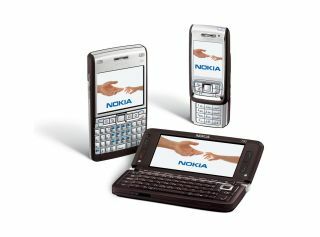 The Nokia E90 Communicator is the latest version of Nokia's long-serving folding Qwerty keyboard design. Based on the Symbian S60 operating system for the first time, the latest communicator is a 3G/HSDPA and Wi-Fi equipped device with onboard GPS satnav capability, a 3.2-megapixel camera and full web browsing capabilities. The device features a 4-inch, 240 x 320-pixel widescreen under its folding shell, with quick access keys for a spread of business applications built into the device. As well as supporting the latest Nokia Maps application for integrated satellite navigation, it offers support for push email for a variety of systems including BlackBerry Connect, plus a document viewer and editor. Full 3G multimedia functionality - audio and video downloads and streaming - is included, and there's a secondary camera by the screen for video calling. A total of 128MB of internal memory is supplemented by MicroSD memory card expansion. Nokia has also upgraded its E61 Qwerty-keyboard device, with the newly announced E61i . Designed for mobile messaging - particularly emailing - it's a BlackBerry-style device based on the Symbian S60 operating system. It's thinner, with more features and an improved email experience and attachment handling. A 3G, Wi-Fi equipped device, it has multimedia capabilities - such as music and video player - as well as business oriented functionality. A 2-megapixel camera is built in. Completing the new Eseries trio is a slim sliderphone, the E65 . Again, it's an S60-based model aimed at the business user, featuring 3G and Wi-Fi, and comes loaded with business-friendly features including push email and PC syncing support. A Nokia Browser is also featured in the specification. The E65 has a large 16 million colour display, with a 2-megapixel camera in the back panel and a video call camera above the display. It's15.5mm thin and weighs in at 115g. The E65 is available now in some markets, while the E90 and E61i are expected to launch in the second quarter of 2007.